For those who arrive on this article without knowing the Scrum, the Daily Scrum is a daily meeting that brings together the entire development team during 15 minutes maximum. let’s take a look at the entire Scrum ceremony. The Daily Scrum is a daily meeting that usually takes place at the beginning of the day (except the day of Sprint Planning). No rule forbids to do it at 2:00 pm but it’s true that in 99% of cases, Scrum teams do it in the morning. During the Daily, each member of the team will explain what he has done since the last Daily, then he will say what he thinks to do until the next Daily and eventually raise an alert (planning risk by example). As a reminder, the entire team should not take more than 15 minutes for the Daily. We generally say that each member should not spend more than two minutes to talk. If a problem is raised and we will probably spend time talking about it, the Scrum Master will have to purpose to talk about this problem after the Daily to avoid to disturb it. Who participates in the Daily Scrum? The Daily Scrum is a ceremony dedicated to the harmonization of the realization. Only the development team participates in this ceremony. The Product Owner can come as an observer but must not intervene. Some teams do intervene him but it’s not a prerequisite; Be careful, however, that the Daily Scrum doesn’t become a reporting tool for the Product Owner because it is absolutely not the interest of this ceremony. The Scrum Master is only there to help the Daily run smoothly. It must aim to bring the production team to autonomy; his goal is therefore that his presence becomes useless during this ceremony. This model of the Daily is really nice because it forces the team to a minimum of dynamism. Be up to do the Daily in front of the board is very convenient and is often more productive. I recommend this format of the Daily Scrum that is one of the most used in this moment. To measure the effectiveness of the Daily Scrum, you must exclude the Scrum Master and see if it still works well. If it’s the case and the Scrum Master is not useful for its smooth running, it is a good news: the team is autonomous for this ceremony. The other way to measure your effectiveness is to see if team members really know what other team members are doing. If everyone is well aware of what each member of the team does, so we have a very effective daily scrum. In the Daily Scrum, we can see certain behaviors set up; it is imperative to quickly end it. For example, some people take out their mobile phone and use it. Obviously these behaviors disrupt the session; the scrum master have to request people to stop to use it. Delays in starting the Daily Scrum in the morning for crazy reasons (making coffee, subway, train…) could become frequent. It sounds funny to read but I have already experienced this type of behavior personally; some people don’t accept these behaviors and pressure could appear between team members. Too bad for the latecomer, the session must start without him. It is also possible to see the “fake” Scrum Master come to the Daily in order to exercise his authority. Be careful with this type of behavior, the Scrum Master is not a boss and is not there at the Daily for that. 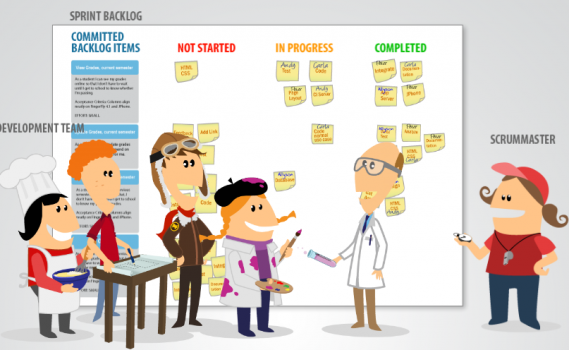 Be careful to the update of the backlog; developers must be used to updating the status of their task; this is especially important when a part of the team is not physically in the office. I cited only two bad behaviors but others will settle in the Daily. Your Scrum Master will have to be the man of the situation if the team can’t regulate itself. Previous PostPrevious LeSS agile framework? Next PostNext How to create your user stories?